Now that you have launched your website you need to be able to do some analysis on it and also measure its performance as you start to build it out. A great way of doing this is to add some basic code to your website. You do not have to do this at all as your website will function perfectly well without it. However if you do decide to set these up, then you can get some very helpful information from those tools. The more you know and understand about your visitors the better you can make your website. There are two free tools that can help you and they are Google Analytics and the Google Search Console. You can set these up using a free gmail account and both of these options are free. The Google Search Console used to be known as Google Webmaster Tools, and has changed a lot since the name was changed. I would recommend setting up both as it is simple to do. If you click on the link above you will be taken to the Google Analytics page and from there you can sign in with your gmail account. If you don’t have a gmail account you will need to set one up and that is a free service. 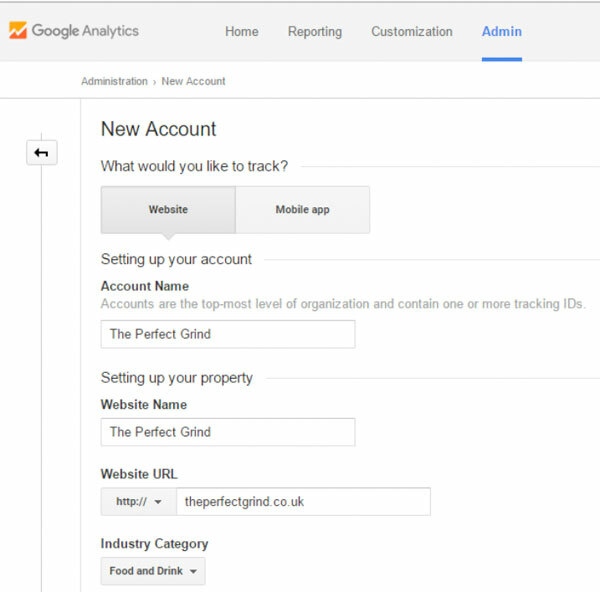 Google Analytics helps collect data about your visitors and also allows you to manage that data within one dashboard. They have a very good Help Centre that can help you understand the purpose of analytics a great deal better. If you follow the instructions there you will find it easy to set up. If you plan on using Google Adsense on your website as a means of generating revenue, then you can link the Anayltics account to the Adsense account. Rather than try to explain it all here, you can click on the support link above for a step by step guide. The image below shows you the type of fields that you have to fill in. For the industry category you match the topic of your own website to an industry category from a drop down menu. You then pick a time zone which should be the UK and then GMT. Google will then automatically offer you a range of data sharing options as shown below. It is entirely up to you as to whether to do this or not. You are certainly not obliged to and to make your mind up, you should read through the various options. At the bottom of the page you will see a “Get Tracking ID” and you should click on that. You will then be offered a Google Analytics Terms of Service Agreement which you should read and accept. (Again please change the country to the UK if you are based there). You will then be given a tracking ID which you should make a note of. It will look something like UA-73539999-1. There is also a script code which you can add to each webpage that you want to track if you prefer that but it is a lot of work. 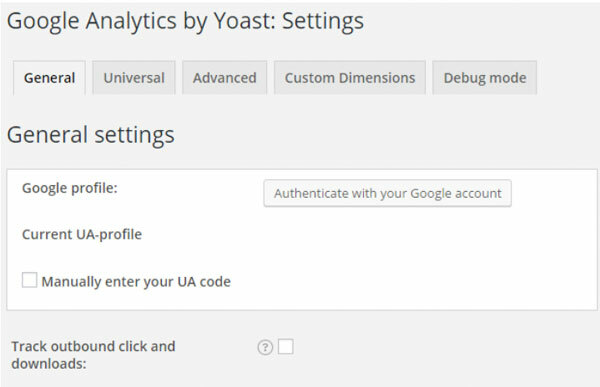 I asked you to install a plugin called Google Analytics from Yoast. You should now go to that plugin and click on settings. Click on the “Authenticate with your Google Account” and a box will appear with a piece of code. Copy that code into a box called “Paste your Google code here:” and then Save Authentication Code. You should now be all set up on Google Analytics. Likewise setting up the Search Console is also something that I would highly recommend. This allows you to help Google find your website for the right keywords and will also show you any errors that Google found on your website when they crawled it. You can then identify those failures and quickly fix them. You can also find out which search terms are leading people to your pages and posts. That way you can find out which are the best performing pages and posts on your website. You can then improve those pages and write similar ones to help get even more visitors. To take advantage of that go to the link above, sign in with your gmail account and follow the instructions. You click on ADD A PROPERTY and enter the URL of your website. You will then be taken to a verification page on Google and they have a recommended method and some alternative methods to do that. The easiest way is to pick the Alternate Methods and then the HTML tag. That will give you a piece of code which you copy. 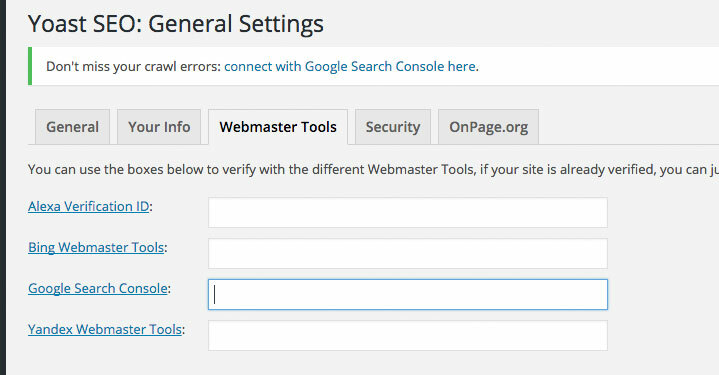 Then go to the “SEO Yoast plugin” and click on Settings and then the Webmasters Tab on the top menu. Add the code to the box called Google Search Consoles and save changes. Then go back to Google Search console and click verify. 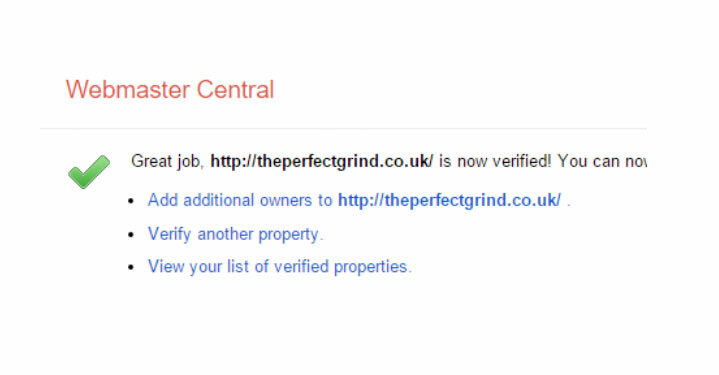 Your site is now on the Google Search Console and you should get a message like the one shown below. Google has produced some very helpful videos within this programme and they are worth watching so as you get to fully understand how useful the information provided can be. There is quite a lot to learn about how to make the best use out of both of these free tools from Google. It is too large to cover in this case study but I would recommend watching all of the videos provided by Google. By doing that you can help make great improvements to your website and also find out how many visitors you get and other very useful information. Watch the videos on how to use both free tools.